DuckDuckGo has a pretty good api for getting short abstracts given a query. I figured that it might be nice to use this to demonstrate how the caching can be used to pass in lieu of not having access to the copy/paste buffer in Google Docs. There is also a video version of this post if you prefer. This example is container bound and starts with a document that has some text in it. 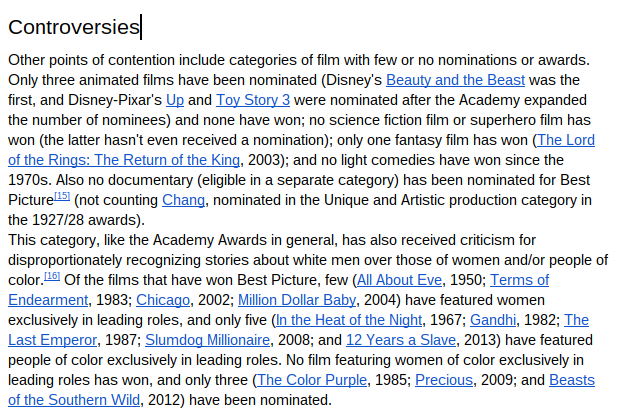 I'm using some text from the wikipedia entry on the oscars - here' s what it looks like. So let's say that you want to add some stuff to a document that references some of it's content. In this case, I want to be able to select the name of the film, do something, and have some additional info about the film added to my document. Let's take 'slumdog millionaire'. First I select the text I want an abstract of. Then I go to where I want the information to be placed in the document - I'm choosing at the end - and take the other menu option. Of course this could easily be developed as an Add-on, but since it's just for playing around with, I'm adding it as a custom menu item in a container document. Cache is used for two purposes - when an abstract is retrieved from the DuckDuckGo API, it stores it in cache in case the same query is made later. The result of the latest query is also stored in the document cache so it can be used for copy pasting. The test document and code are available at this link. var imageUrl = data.Image ? url:data.Results && data.Results.length && Array.isArray(data.Results) ? Of course you can use this for any subject matter that has been indexed by DuckDuckGo. This article is adapted from my Going Gas book.